A double entry into the weekly recap as I wasn't able to post anything over the easter weekend (was in Sydney!). I'll get straight into it..
Mr Jack Pocket: Spoiler alert for the board games purchased this week. I finally own an edition of Mr Jack. Until these last two weeks I'd actually never played any edition of Mr Jack, but had heard some decent things about it. 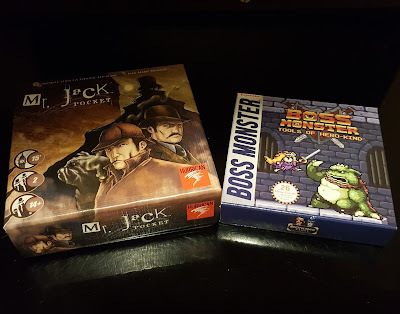 Mr Jack Pocket edition plays along like a puzzle more than a mystery/deduction game and I found it to be a reasonably achieved effort of a quick game to take anywhere. From what I gather, while it uses the same 'Mr Jack' name as its counterparts, the other two editions are actually quite different. For my tastes, I'm thinking I would have been better off with the non pocket sized travel edition but can still see myself occasionally pulling this out for some quick puzzle fun. T.I.M.E Stories - Asylum: Our second run through - and our second failure. We took too long in between plays and as a result I think our lack of good memory cost us this game. Our plan was to try and rush and just go to areas we didn't previously explore, but we forgot about things we actually needed to do to be able to properly explore which unfortunately cost us a fair bit of time. I still loved it as much as the first time I played and desperately want to solve the case. One member of our party unfortunately feels the opposite and will need some convincing just to finish which is a bit of a shame. Each to their own! Oh and we also think we got right to the end but couldn't actually figure out how to advance the game.. Hopefully it makes a bit more sense when we aren't as rushed in the third play through! Ultimate Werewolf: So after the aforementioned game fell flat, peoples moods had drifted from games. This was actually almost a bit of a hard sell to get it started, but we played about 7 or 8 rounds before realizing it was actually getting pretty late. Ultimate Werewolf is the game that I've not only played the most but its the game I've played with the most number of different people. I'd say I've easily played this with 80 different people and I'm still yet to come across someone who actually hated the game. Everyone likes it and most people seem to love it. The #1 go to game for a decent sized group that I own in my collection and I highly recommend it. I should mention - I've never actually tried One Night Ultimate Werewolf. I'm sure its good, and maybe its better than the original, but I'm sticking with the tried and true. If it ain't broke, don't fix it. Escape: The Curse Of The Temple: We had some friends newer to the board game scene, and this was the first game I decided to show them. 10 minutes, frantic, fairly easy to understand and of course some good fun. I'll admit after a dozen or so plays I found Escape started to lose a bit of its appeal and we had worked out a method that seemed to work most of the time. I bought an expansion to try and fix this problem, but I haven't even bothered to learn the expansion let alone try it. After this session which actually was meant to be one game but turned into three (and nearly a fourth..), I'm inspired to have a closer look at the expansion for next time we try it. I had forgotten the appeal and charm of Escape and it is actually really exciting to play for the first few times. I'm hopeful we'll see this out again in the next month with the expansion! Incan Gold: After Escape we turned to Incan Gold. I love pushing my luck, so much so that I came dead last with a giant score of zero. Yes I pushed and pushed being last left EVERY time, but after coming up empty handed the first three rounds I just had to go big for the last two. Clearly I'm not a good gambler and should know when to give up. Regardless, it just makes Incan Gold even more fun when someone has pulled out just at the perfect moment and can sit back and watch the demise of their fellow explorers. Another hit for the night, but we only played the one game. Saboteur: An oldie but a goodie. I have Saboteur 2 in the library but even though it's rated higher and generally seen as the better game - I feel like some of the charm gets lost without the simplicity of dwarves vs saboteurs that the original has. As a result, I stuck with plain vanilla saboteur to end the night and went three for three on board game choices. Another game that had everyone laughing, talking, accusing, fighting and having an all around good time. Great way to cap off the night and also my only victory (we lost all 3 games of escape! ), which is always a bonus. Mr Jack Pocket: I've always enjoyed two player games as all you need is a friend or significant other, and you've got yourself a games night. While many games can be played with two players or have a variant to accommodate - I tend to find games designed solely as a two player experience generally work better. Mr Jack is one I've had my eye on for a couple of years now, but I could either never find it in Australia or found it ridiculously overpriced. That was until I found this little treat on sale. As I mentioned above - it wasn't really my edition of choice, but I'm sure it will find it's place in the library. Boss Monster - Tools of Hero-Kind: Recently I've tried to shy away from expansions as I've realized with the exception of a handful, I rarely get to or want to play them. Unless you have a group committed to a certain game that you see a fair amount of play time with, expansions can unnecessarily complicate things. Boss Monster didn't really need an expansion for me personally, however this was not only cheap to buy but it doesn't look to complicate things too much and looks like an expansion that can be combined with the original even on your first play. Of course I haven't tried it yet to prove that, but I'm hoping I'm right..